It is called "Jacob's staff". It was an old astronomical tool used for trigonometric purposes. This device was invented by a Jewish Rabbi, Levi Ben Gershon. It was used to measure the angular distance between two stars or, in general, any pair of celestial bodies. Ptolemy lived 1000 years before the invention, so this is only the product of the artist’s fantasy. 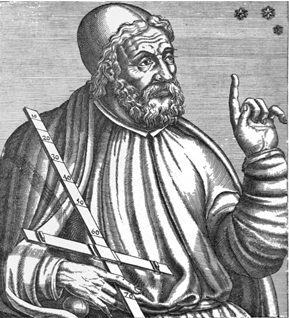 And this tool has been known under many other latin names than baculus Jacob: radius astronomicus (astronomic ray), crux geometrica (geometrical cross), revelatorem secretorum (secret decipherer). It is the hand-held version, a mounted version exists. Abstract: This survey traces the history of the astronomer's cross staff on the Continent from Levi ben Gerson to Gemma Frisius, in England from John Dee to John Greaves, and again on the Continent from Tycho Brahe to Adrian Metius. The emphasis throughout is on sources and influences, on distinguishing the various kinds of cross staff, and on clarifying terminology. It has been used in navigation, perhaps as an upgraded version of the kamal. What were Riemann's other two submissions for his habilitation? What is the history of the meanings behind the word “Geometric”?